BANKING RULES FOR FOREIGNERS. Existing foreign customers are OK & new customers it seems are not subjected to these new rules. Please go to your bank for verification as you should find in English the new rules on their display boards. However we understand the Bank's are taking a case by case attitude and we welcome this news. It seems at present its a lot easier to open a Bank account. It was an Anti-money laundering law passed in 1999 by the Bank of Thailand The main threat has been money laundering from amphetamines, gambling & prostitution with perhaps 1% being attributed to foreigners of Thailand. Amphetamines are an internal cash flow commodity & the money gained by this illicit trade is in the billions of baht made by the Wa & therefore is not considered an export commodity like heroin & hashish/marijuana. July 17th: GOOD NEWS!!!!!!!!! Our MP has tabled this issue. 1. Identifying the definition of “ deposit account” to include all types of deposit accounts that commercial banks have been currently granted and may be granted in the future. Furthermore, “depositor” shall be meant to include the legal assigned person or the authority transferee to whom the authority associated with the opening of deposit account is transferred. 3. Commercial banks shall inform depositors who open the deposit account in accordance with number 2 to submit documents such as Identification card, copy of Residency registration, or other identification documents issued by government agencies. Juristic person shall declare Letter of Corporate Intent, Letter of Acknowledgement from Buroau of the Partnership and Company Registration, Department of Commercial Registration, Ministry of Commerce etc. Commercial banks shall request depositors to submit copies of all mentioned documents with signature of verification. 4. Commercial banks shall verify the identification documents described in number 3 according to the general practiced procedure with absolute caution and honesty and shall retain all the mentioned documents at least 5 years commencing from closing of each deposit account. 5. Commercial banks are prohibited from allowing depositors to conceal their names and to use alias or false names on their accounts. 6. Commercial banks shall enforce the conformation of depositors, who have had the deposit accounts before the declaration of this notification, to the practice of this notification within 6 months commencing from the effective date of the notification. 7. This notification shall be effective from June 12, 2000 thereafter. Since this date the laws have been relaxed and you can obtain a letter from immigration then take copy of your passport to the bank you wish to open the account. Try the Bank of Asia , they just ask for a passport to, open a deposit account, but be warned when transferring money from overseas, this can take at least two weeks, they are not up to speed on this one, but they seem very helpful. Thai Farmers bank want my Thai drivers license and passport to open an account. All this nonsense about Thailand as a money laundering place, what a joke. Have you ever tried remitting money from Thailand? what a performance. MAE SAI: One of Thailands most popular border crossings with Myanmar. Go to the bridge where you exit out with Thai immigration. Cost on the Burma side is $US5 or 250 baht. If you need to contact your Embassy in Thailand. For Thai to English translations no need to use a translator any more. Go to www.links.nectec.or.th/services/parsit/ for a translated version of a website from English to Thai. The site will not translate complicated English sentences but can handle the smaller words and short sentences.& this service is provided FREE. Whatever it is including exchange books for rental the law states you must pay VAT. Do not listen to people who say no you are exempt as there is no such word. Remember there are 3 categories of Business in Thailand & category A is out for foreigners eg. being a barber, making bread?? Please talk to your lawyer as too many expats are gullible and jump into the fire always too late after they have started their business. Most important find a good lawyer but check his or her prices first & most of all make sure they are a Thai lawyer-- not a notary. The most important thing is never give a deposit over until your contract is sited & you are totally satisfied. What's an extra day to get someone else to review your contract!!. The Thai Foreign Business law (FBA) was revised in March 3rd 2000 replacing the Alien Business Law of 1972. In Chiangmai we can help you set up your company or limited partnership. 1/. Contracts written in English do hold weight & are valid in Thailand. 2/. Wills should be made in Thai but they can be written in English as well and require 2 witnesses. 3. In criminal cases there are no juries, only a Judge. There is a time limit on being held in detention before a trial & on average it can take between 1 to 2 years to adjudicate a court case. 4. Police must have a Court order to authorize a search. 5. There are ways for a foreign spouse to protect his investment in land and houses here in Thailand. 6. Prenuptial agreements are possible here in Thailand. 7. If you have a company & want 2 foreigners working with work permits you must have share registration of between 3.05m baht & 3.5m baht on paper. For one foreigner 2m baht. 8. Thai companies can be formed for around 10,000 baht if you know how to go about it without work permit. Most companies charge 5000-10,000 baht for the work permit. Never pay more than 38,000 for a company but this will vary according to the type of company you are forming & of course the law firm you use. 9. You need to choose 3 names to be considered for your company. A simple task you can do with a Thai friend and can take a min of 3 days & 120 baht to file at your local City Hall. This wee job can save you anything from 2000 baht to 8000 baht? 11. If you have a problem with a certain Police Officer ask to see a higher rank. 12. Finally we will soon have a breakdown of costs for law work. If in doubt ask us. One price for foreigners & one price for Thais? What do you think.? The Forestry Dept has initiated a 200 baht entry fee for foreigners in the Thailand national Forests as at June 6th.Similar unfair treatment occurs in other countries including China but are strongly criticized. A senior TAT Official called this price increase "a rip-off" "Foreigners are guests in our country. If government agencies behave like this, how can we stop other local people from cheating and ripping off visitors". If you want to STOP payment on a check as of September 2000? the Bank of Bangkok will charge you 1000 baht. We had a cheque returned from the USA by an Internet Company as we did not want to proceed. On June 8th we received this cheque from our Bank and posted it thru to the USA. No problem. When it arrived we asked for it to be returned but went into our Bank to ask if we can stop payment on it. Reply was no they needed the cheque first. We waited and waited--no cheque. We decide to STOP payment on the 15th August 2000 after 4 weeks when we realised the cheque had now gone astray. The USA confirmed the date they sent it. We went to the Bank of Bangkok at Thapae Rd, Chiangmai & were politely told yes! you can STOP payment but the fee is 300 baht. We gave 300 baht and received a receipt. They said wait 1month which we did. Hearing nothing we returned one month later ( they saying they rang often yet we do have an answer phone service on our lines & nothing was passed on)? The Bangkok Bank now told us on 8th September they had changed the rules and that they wanted to refund the 300 baht because if we wanted to proceed with the STOP payment it would now cost us 1000 baht.However they neede the cheque to come in-- we told them you have a record of this cheque on your files--simply delete and give us back the money that is rightfully ours. No mention of another 700 baht-- they wanted us to sign the receipt for 300 baht & said sorry your cheque was only for 1078.00 baht which mean't it will be a waste of time for you to recover 78baht. 1/. We asked politely when was this new rule changed Their Answer: We don't know? 3/. We asked if the cheque comes back will we be notified. Answer Don't know ( but we know they never left an answer on our phone system when the month had expired to obtain our reimbursement). 5/. We asked can you look up this cheque: No 0251-00/0177 June 8th for $US25 = 1078.00 baht Number today and see if it has been cashed. Answer No. 6/. Well what else can we say!!!!!!!!!!!!!! 2/. When was this new law initiated 300 baht to 1000 baht. 3/. We paid the 300 baht in confidence knowing that the bank would carry out its obligations. if the rules change the status quo surely stays the same for those who have paid under the old system remembrring we have waited since June 2000. 4/. Who will get this money?????????Guess. We will keep our readers informed as this is not fair. No other Western Bank has such a policy?? But, lets wait and see..
HAVE A SPECIAL OFFER with FREE accident insurance if you open up a Savings account with them. Min 3000 baht deposit. We have been told by a few disillusioned readers they are far superior than Thai Farmers & especially Siam Commercial Bank. However their shares are not?? but its worth opening up a 20,000 baht account then you receive your ATM card & Accident Insurance card. Times (X) your savings by 20 & thats your cover-- best of all it's FREE COVER. It is not a comprehensive insurance policy or health policy & is limited to oneself being either a driver or passenger in a motor vehicle or as a victim of violence. It may suit some people. The Bank of Asia are also the only Bank that has ecommerce facilities & Thailand residents can now join. You must put up a 100,000 baht bond. 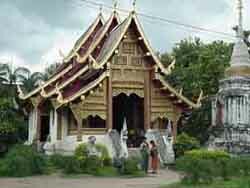 They also have houses for sale everywhere all over Thailand & the prices are excellent. If you decide to change your date of departure and the airlines say sorry everything is fully booked don't believe a word they say. Normally this means they cannot secure a commission as all they are doing is reallocating your seat for you forward which means they lose out on a paying ticket. If this happens go direct to the Airline in your own country as you'll find it isn't the case. If the airlines charge you 200 baht to change your booking please go to your nearest phone and ring the head reservation office of the airline. If not email back to your home where you purchased your ticket or the Airline you are travelling on and they will change accordingly.